Nike… Proper sports company or just another brand? Over the years we all collect a variety of sports kit and, given that cycling involves such a broad need, I suspect that the majority of us don’t have a particularly structured approach to what we use. My son plays football and he needs good boots, decent trainers, a base layer and his team kit – throw in a few pairs of tracksuit bottoms and some spare shirts, and you’re pretty much done. Cycling however means covering the weather and road conditions – hot hills, cold country lanes, wet commutes – without getting into road rides versus mountain bikes thrashes. Throw in the need for family rides and over a few years you’ve suddenly got a draw full of different layers (short sleeve, long sleeve, thermal, not-so-thermal-but-not-cotton, old polyester versus new merino), more gloves than you need, a few buffs, tights and leg-warmers, baggy shorts and lycra, normal shorts and three quarters. Not to mention bits of clothing for the kids and a growing collection of jersey taking up precious space in a wardrobe. But amongst all of this, I would hazard a guess that you probably turn to a small number of tried and trusted pieces of kit, and they’re probably the bits that are showing their age, but they’re so well made and so comfortable that they continue to do the job just perfectly. And that’s how it is with my Nike winter gloves. They aren’t big thick thermal things, the sort of gloves that implies a promise to keep your hands warm, but turn into a sweaty uncomfortable bag shortly into the coldest ride, or that leak water at the first bit of spray. No, my Nike winter gloves don’t look like the archetypal winter gloves should do – they are a fairly thin thermal layer that miraculously keeps the wind and spray out, and once they’ve warmed up (which can make the first few miles a bit chilly on the finger tips) make for a thoroughly pleasant ride. Even now, in their rather ragged state with worn out finger tips, these gloves are continuing to work as they should do and are still my ‘go-to’ gloves for a chilly road ride. If it wasn’t for these gloves and the obvious thought & workmanship that’s clearly gone into them, I’d be saying that Nike has evolved into a fashion brand that relies on high-profile star endorsements to keep them on the sports field. But every now and then Nike break that stereotype and come out with a fantastic piece of kit that makes the sport quite a bit more pleasurable, and makes it easier to choose the right gloves for the job. The trouble with this approach is that it takes a drawer full of gloves and other bits, lots of failed attempts at finding the ideal glove, to work through what’s good and bad for your specific needs. 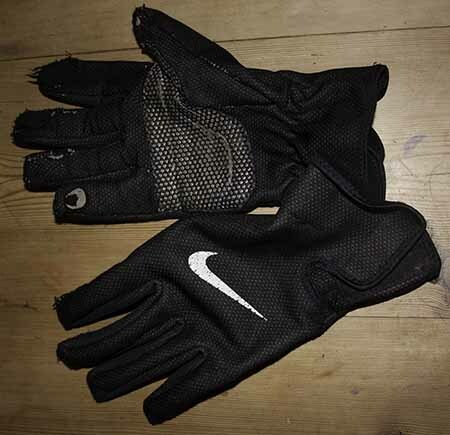 I wouldn’t normally have considered buying Nike gloves for cycling and would still be sweating in some magazine recommended option or freezing in a cheap option, but I must have stumbled over them at some point five years ago. So I’m going to be brutal with my cycle drawer this week and resign all of those unused options to a box in the garage – by rights they should go to the charity shop, but you never know when my Nike gloves might finally give up the ghost and Nike have dropped out of the cycle market now, so that leaves me searching the glove options again. Previous PostWhen is it too cold to ride safely?